I love the concept of Noisy Thinking so I thought I’d take the concept literally by thinking aloud for my 10 minutes. No slides, just 1 Tweet (my favourite Tweet as it happens) sent by Seth Meyers during the Oscars last year. It’s beautifully simple – I like it when we all watch the same thing but there’s a huge amount of richness in it. So here’s 10 things for modern brands to think about that I took from Seth’s Tweet. 1. It’s vertical (it was sent by and predominantly seen on a mobile phone). A highly executional thing to start with but clearly brands these days are increasingly operating in a vertical world (i.e. a mobile one) as well as a horizontal one (far more so than even 3 years ago). 2. 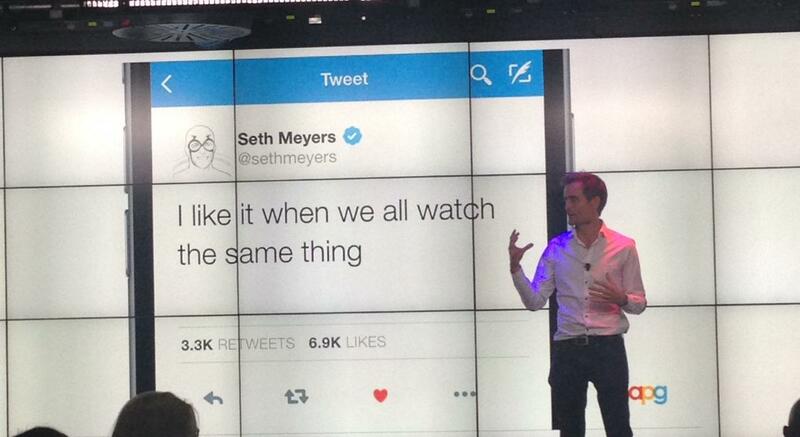 It’s ‘both and’ not ‘either or’ – Seth is watching TV (which according to some is ‘old media’) and using Twitter (notionally a ‘new’ one) simultaneously. They’re not jutting up against each other but complementing each other beautifully. It speaks to a universal truth of human behaviour – we’re herd creatures that value social proof and commonality (hence the sentiment of the Tweet). Technology here is the enabler. How can brands be the same? 3. It used humble language. It’s not “AMAZING when we all watch the same thing”, it isn’t “you’ll never guess what happens when we all watch the same thing”. There’s humility here in a world of hyperbole. Something to think about for brands in a world that seems to constantly demand more noise. 4. It’s context perfect – both to the platform it appeared on but also to the moment in question. It wouldn’t have worked an hour earlier or a day later. The best modern brands recognise the power of context and use a hyper-context world in which we’re living with agility and nuance. 5. At the same time it’s consistent and on brand (i.e. it chimes with Seth’s general personality and other Tweets). The same message from – say – Donald Trump would seem incongruous. It’s Seth’s consistency that enables the context to really work. When brands know what they are and what they’re not it becomes easier to adapt to context. 6. There are signals in here. We know from this Tweet that Seth is watching the Oscars, is on Twitter, likes to watch things with others etc. And of course people give out signals like these everyday. But it’s how a brand responds to these that matters. It’s perhaps an over-simplification but if a brand responds to signals in the same way a good friend would (with sensitivity and empathy without being over knowing) it probably won’t go far wrong. 7. It’s warm and it made me smile. We talk a lot in about reach, impact, awareness, mental availability. This Tweet just reminds me that it’s good to be liked. 8. I don’t follow Seth on Twitter. I found this Tweet because someone effectively said “look at that” (by Retweeting it into my timeline). It’s increasingly a “look at that” world and this clearly provides an opportunity for brands to be the “that”. We risk overstating this of course and assuming people are interested in every brand but the rewards of getting it right and providing serendipity for people (I think of serendipity as disruption’s slightly nicer cousin) are very real. 9. It’s participation optional. I can respond to it and interact with it if I want to (and many people have) but it’s not begging for attention or asking too much of its audience. (*) David Wilding is Director of Planning at Twitter UK.